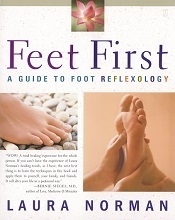 Designed for everyday people for everyday situations, this accessible and informative book guides you through the subtle energy flow and revitalization techniques of reflexology. The foremost reflexology expert, Laura Norman, explains how to relieve diverse physical conditions, from common headaches and insomnia to high blood pressure and excess weight. With Feet First, you'll learn to maximize the natural internal healing mechanisms of the body to help reduce stress, revitalize energy, strengthen the immune system, stimulate creativity and enhance relationships. -Descriptions of each reflex point, the 6 basic techniques and easy-to-learn specialized and master routines. -Specific chapters covering stress, sports injuries, addiction problems, the terminally ill, women and couples.